Punch a hole in the atmosphere with the Riptide. The Estes Riptide Launch Set contains almost everything you need for hours of high flying fun. This shiny rocket is factory assembled by specially trained craftsman to give you a top quality beginners’ rocket. 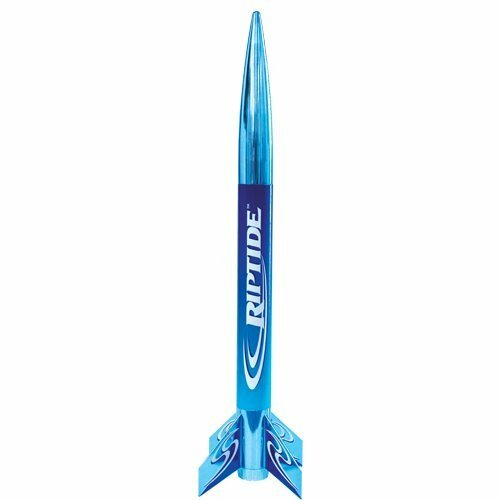 The Riptide is an aerodynamic bullet full of features like a really cool, blended blue body tube, totally awesome and highly reflective, blue chrome colored fins and nose cone. This showy rocket is ready for liftoff in just minutes. The exciting Riptide stands 18 ” (45.7 cm) tall. When launched on our standard engines, it can reach cloud topping heights of over 600 ‘ (183 m). It returns smoothly on a colorful 12 ” (30 cm) preassembled parachute. Rip through the sky with your own ready to fly Riptide. Estes launch pad with launch rod and an Electron Beam Launch Controller included. Requires Estes engines and 4 AA 1.5V Alkaline batteries for the controller – sold separately. Recommended for ages 10 and up with adult supervision for those under 12. The Riptide Launch Set is another great kit from the Ready to Fly (RTF) Series and with no assembly required, you are on the launch pad quick! Using standard Estes engines, it can reach cloud topping heights of over 650 feet. Rocketeers aged 10 and up can enjoy high-altitude thrills, with adult supervision for children under 12. For your launching convenience, an Estes launch pad and controller are included in the set. This shinny rocket is factory assembled by specially trained craftsman to give you a top quality beginners’ rocket. The Riptide can reach cloud topping heights of over 650 feet. Punch a hole in the atmosphere with this rocket! The Estes Riptide Launch Set contains almost everything you need for hours of high flying fun! This shiny rocket is factory assembled by specially trained craftsman to give you a top quality beginners’ rocket. 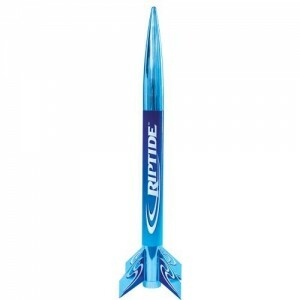 The Riptide is ultra-aerodynamic and has highly reflective blue chrome colored fins and nose cone. The exciting Riptide stands 18 inches tall and returns smoothly to the launch site on a colorful 12 inch preassembled parachute. It also comes with an Estes launch pad and launch controller for your rocket launching convenience (four ‘AA’ alkaline batteries required – sold separately). Adding to your growing fleet of Rockets? 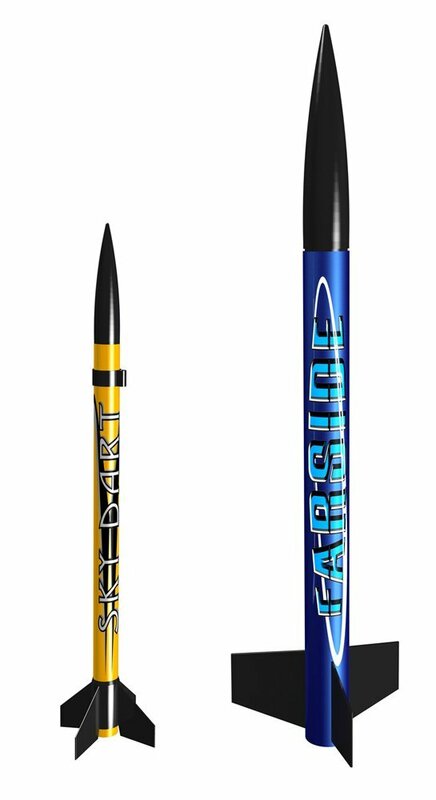 Check out another Estes Classic inspired by a long-range ballistic missile, the Patriarch RTF Model Rocket Kit, which uses the same launch system that comes complete with the Riptide! In addition to the excitement and entertainment it provides, rocketry also has significant educational value. Model rockets transform kids into amateur rocket scientists, encouraging them to think about how the rockets work. Rocket building teaches kids the basics of propulsion, flight, and aerodynamics, and can help foster an early interest in science and engineering. As a part of the RTF series, the Riptide can be assembled in just minutes. No special tools or painting are required for this kit, leaving more time for flying. The Riptide is a reliable, high performance rocket for kids of all ages to enjoy. The Riptide requires Estes engines for the launch (not included). Start with the B4-4 engine for the first flight. Use Estes engines B6-4 or C6-5 for subsequent flights. Unless otherwise specified, all models require assembly. Tools, construction and finishing supplies sold separately. In order to launch, a launch system, model rocket engines, igniters, recovery wadding and four ‘AA’ alkaline batteries are required – sold separately unless otherwise specified. Read all instructions before beginning. Make sure you have all parts and supplies required. Test fit all parts before applying glue. Sand as necessary for precision assembly. Product color and shape may vary. When launching, stand back as far as the launch controller cord will allow (15 feet). Rocketry is not intended for indoor use. Choose a large field (500 feet), free of dry weeds and brown grass. 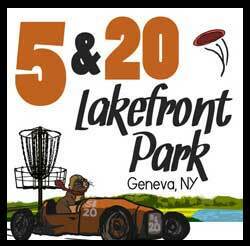 Launch only with little or no wind and good visibility. Preassembled Riptide rocket, 12 inch parachute, Electron Beam Launch Controller, Porta-Pad II Launch Pad and instructions.